Thanks to the Sensor, Switch, Smart Camera, and Machine Vision device OEM's who've helped us compile our listing here. Self-contained control - A photoelectric or proximity control in which control sensing, signal conditioning, and output occur in a single device. semiconductor An electronic component material whose resistance varies when exposed to fluctuating energy levels. Sensing distance - The distance between the sensor and a standard target at which the sensor will effectively and reliably detect the target. When the target is detected the sensor turns "On", generating an output signal, see the below figure. Many standard proximity sensors detect different metals at different distances. Cushioned Sensor Mounts are sensor brackets that protect sensors adjusted too close to targets, thus reduced sensing ranges will not create costly sensor "downtime". When a sensor turns "On", and the target starts to moves away, the "Reset distance" is the target travel required to switch the sensor out "Off", see Hysteresis. Sensing end - The end of any fiber optic cable at which objects to be sensed are located. See bifurcated fiber (optic), individual fiber (optic). 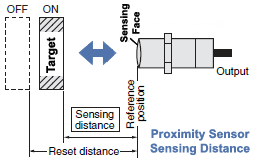 Sensing face - A surface of the proximity sensor parallel to the target, from which operating distance/range is measured, along the reference axis. Sensing mode - The arrangement of components (emitters, receivers, reflectors, etc.) in a sensing application. Sensing range - Transmitted beam mode: the distance from the emitter to the receiver. Retroreflective mode: the distance from the sensor to the retroreflector. Diffuse mode: the distance from the sensor to the object being sensed. See transmitted beam mode, retroreflective mode, diffuse mode. Sensitivity adjustment - An adjustment that determines the sensor’s ability to discriminate between different levels of light or ultrasonic waves. Sometimes called the “gain adjustment” . Sensor Accessories - When offered by sensor OEMs, accessories are parts used in the installation of their sensors and switches. They comprise add-on devices, some required, and others that add additional features, like protection, quick-change out, etc. Others may be very product-specific. Some examples include brackets, power supplies, test or set-up tools, and some other shown below. Separate controls - A system in which sensors are remote from power supply, amplifier, logic device, and output switching device. Series circuit - A circuit in which current has only one path to follow. SG - A SoftNoze acronym for Sight Glass Mount (SG) product line. Shielded sensor - A sensor which can be flush mounted in metal up to the plane of the sensing face, and it only “senses” outwardly from the front of its face. 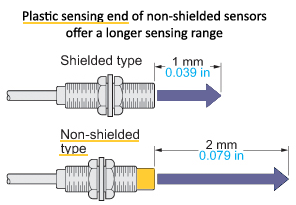 As shown below, a plastic ended "non-shielded" sensor can sense twice as far, but cannot be embedded in metal, see "Non-shielded" sensors. SHCS - "Socket Head Cap Screw", a style of fastener for mounting and fixing sensors or control components. 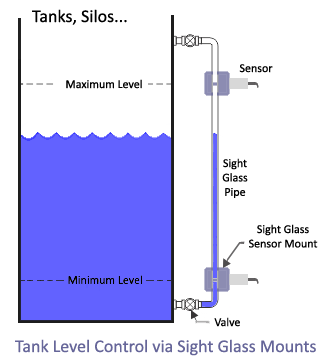 Sight Glass Mount (SG) - As shown below, two capacitive sensors held in sight glass mounts are used to control the levels (max and min) in a tank. The Sight Glass Mounts can be slide up and down, for on-the-fly adjustments. Short circuit protection - The ability of a solid-state output device or circuit to endure operation in a shorted condition indefinitely or for a defined period of time with no damage. Sinking - The output of a DC device that switches ground (DC common) to a load. The load is connected between the output of the device and the positive side of the power supply. The switching component is usually an open collector NPN transistor with its emitter tied to the negative side of DC supply voltage. Skew angle - Used when mounting (a) retroreflective and (b) diffuse sensors, to optimize sensing conditions. a) Diffuse mode: it reduces background reflections; sensor is angled so its beam strikes background at an angle other than 90°. b) Retroreflective mode: skewing is done to reduce the amount of light reflected directly back by the object; sensor and reflector are angled so beam strikes at angle other than 90°. Slow make–slow break - A type of contact; force is applied to operate the contacts without any overcenter mechanism. Contacts move at a speed directly related to the speed of operation of the actuator. Contact force is directly related to the amount of contact movement. Contacts may touch with little contact pressure. Smart sensor - Smart sensors are so called, smart, because they have the ability to collect much more information than traditional switches that simply detected if an object is in position or not. Examples of smart sensors are 2D Code reader or 3D camera/sensor, an a Machine Vision sensor. Snap action - A rapid motion of contacts from one position to another position. The motion is a constant and is independent from the speed with which the switch actuator is moved. Contact pressure is stable due to spring tension. Snap action/IEC direct opening action - This contact structure is very similar to the snap action contact with one addition, continued operation of the operating mechanism beyond the normal snap action position applies force directly to the normally closed (N.C.) contact, if it does not open with the snap action mechanism. This force is applied after the Overcenter mechanism. For example, if a contact has a snap action operating point at 40° rotary movement, the direct opening action point may be in the area of 60° or more. No direct opening action forces are applied to the N.O. contact as it changes from an operated closed state to its normal state. Solid state - Circuits and components using semiconductors without moving parts. Example: transistors, diodes, etc. SoftNoze™ - A tradename of, and the founding idea behind, our company "SoftNoze USA Inc". Our first innovation was a spring-loaded mount for Inductive proximity sensors. Since so many "hard-mounted" sensors were seen being damaged by accidental collisions and abrasion (and thus creating enormous amounts of costly downtime), it proved a popular idea. With the saying, "Nobody likes a hard nose", in our founder's mind, and sensors having nose-like faces, it seemed to fit the situation of "hard mounting" sensors. Thus the saying was expanded to, "Nobody likes a hard nose, that's why we invented soft nose". Placing the two words together, and swapping in the 'Z', gave us a trademark! This is why our first product, the SoftNoze Cushioned Sensor Mount and our company carries this odd, yet memorable, name. Sourcing - The output of a DC device that switches positive DC to a load. The load is connected between the output of the device and the ground (DC common) side of the power supply. The switching component is usually an open collector PNP transistor with its emitter tied to the positive side of the supply voltage. Span - Used to describe the maximum voltage or current in an analog output range. Analog sensors have an adjustment for setting the span value. Specular sensing mode - A photoelectric sensing mode where an emitter and a receiver are mounted at equal and opposite angles from the perpendicular to a highly reflective (mirror-like) surface. The distance from the shiny surface to the sensors must remain constant. Spectral sensitivity - A photodetector’s ability to “see” the different wavelengths (color) of light. SPDT - Single Pole/Double Throw: a set of switch contacts of which one is “open” when the other is “closed”. See "Switch Configuration" below for an illustration of this and other typical limit switch control/input and wiring options. SPST - Single Pole/Single Throw: switch with a single contact that is either "Normally Open" (N.O.) or "Normally Closed" (N.C.). See "Switch Configuration" below for an illustration of this and other typical wiring/control options. Stainless steel, 303/304 - A common metal alloy, stainless steel 303/304, contains Chromium (Cr) making it rust-resistant. Better quality sensor housings, sensor brackets and switch mountings, fasteners and adapters are made using this material. It's used to meet more stringent requirements of FDA and other higher quality (and higher cost) sensors, sensor brackets and switch mounts are fabricated from 316/318 stainless steel alloy. Material call-outs on a datasheet or BOM will indicate this material as "303", "304", or "303/304 SS". If "SS" is indicated, confirm grade to determine suitability before specification or purchasing a sensor bracket or switch bracket. Stainless steel, 316/318 - A metal alloy, stainless steel 316/318, contains more Chromium (Cr) content making it more rust-resistant that 304/306 . Many "better quality" sensors, housings, sensor brackets and switch mountings, fasteners and adapters are made using this material to meet stringent requirements of FDA, washdown and those found in food manufacturing and pharmaceutical industries. These materials lead to higher quality, but more expensive sensors, sensor brackets and switch mounts. Material call-outs on a datasheet or BOM will indicate this material as "316", "318", or "316/318 SS". Supply voltage - The range of power required to maintain proper operation of a photoelectric sensor, proximity sensor, or control base. In a limit switch, it is important to understand the switch's "poles" and "throws" specifications, typically called the "switch configuration". The four common types are; Single Pole/Single Throw (SPST), Single Pole/Double Throw (SPDT), Double Pole/Single Throw (DPST), and Double Pole/Double Throw (DPDT). The number of poles and wiring allow different control options, per the following illustrations of switch configurations. Switch type - A basic difference between most sensors and switches, is sensors tend to be solid state (fully electronic, without moving parts), whereas (limit) switches utilize a mechanical actuator to change electrical state. However, the SoftNoze Proxtrol Limit Switches combines properties of both inductive proximity sensors and limit switches. Switching frequency - The maximum number of times per second the sensor can change state (ON and OFF). Usually expressed in Hertz (Hz).